A simple vegetarian recipe for pasta with cherry tomatoes and garlic with a quick homemade chili-garlic oil with lemon zest. It’s a Sunday night as I sit here to write this post. I’m feeling sleepy and grateful. I just ate a huge bowl of this simple and impossibly delicious pasta with cherry tomatoes and garlic. The same pasta I have been eating over and over again for practically an entire month. Some things just don’t get old, and this pasta, with its deeply flavoured homemade chili-garlic oil is one of them. I used to write most of my posts in the early hours of the morning. I’d wake up before class or work and write in the quiet of the morning with a steaming cup of coffee. A slow and quiet way to start my day. Things are different now, my alarm goes off between 5-5:30am and it’s off to the races. No time for writing anymore, though I do miss it. I find my mind is at its clearest earlier in the day. But these changes are good changes. I’m starting to realize that while it may not seem like it at first, most changes are good changes. Why does change always seem so threatening when it’s happening? I believe in the power of progress and small victories, and when you break this down, progress is really just a veil for change, isn’t it? Change forces us outside of our comfort zone. If you know me, you know that I love my comfort zone. I thrive in my comfort zone. I love this life I am creating, it’s comfortable and wonderful. This summer was filled with experiences outside of my comfort zone, things I might have said no to at one point, but fully embraced this summer. I think this is going to be an ongoing theme for the next little while. There is still so much of 2016 left to live. I hate that feeling when suddenly time has flown by and you’re left sitting there wondering what the heck you have been doing. This pasta recipe is a quintessential Living Lou recipe. Simple ingredients, big flavour. A cooking technique that may seem a little more complicated, but that will elevate your everyday eats. I think we should all try to add a touch more sparkle and effort to our days. Let’s start by making pasta. Cook pasta according to package directions. Reserve 1 cup of pasta water. Add oil to a large saute pan.Turn heat on medium, add garlic, chili and half of lemon zest. Cook for about 4 minutes or until garlic starts to brown. Turn heat down to low, add cherry tomatoes and cook for 6 minutes, stirring occasionally until tomatoes are blistered and have softened. Add pasta and cooking water, 1/4 cup at a time until sauce coats the pasta (you won't need all the cooking water). Toss with remaining lemon zest, basil and parmesan cheese and serve. 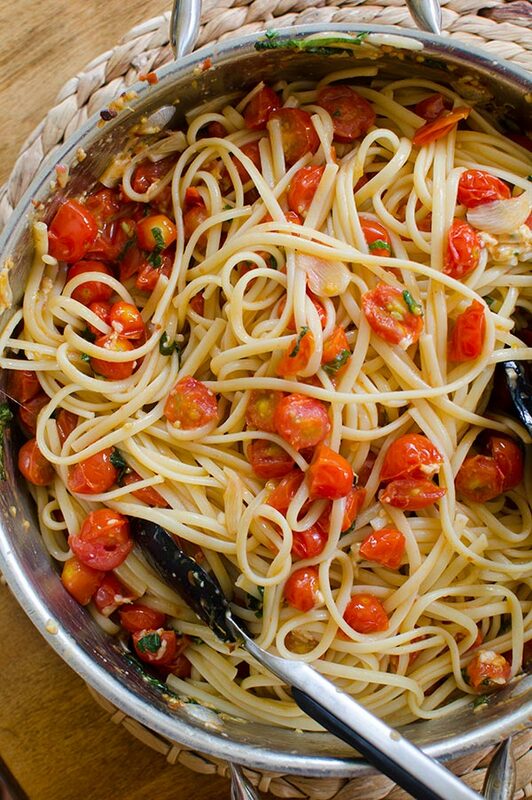 Let me know if you give this recipe for pasta with cherry tomatoes and garlic a try in the comments below. This is exactly the pasta sauce that I have been looking for! I am going to make it tonight! know I will love it! I love my "comfort zone" as well but it is good to venture outside of it (often) & I'm happy to know that you ventured outside of yours & are having a great summer! Keep these awesome recipes coming! I made this recipe & I love, love, love it! Thanks, Living Lou! Hi Lou, enjoy your blog! 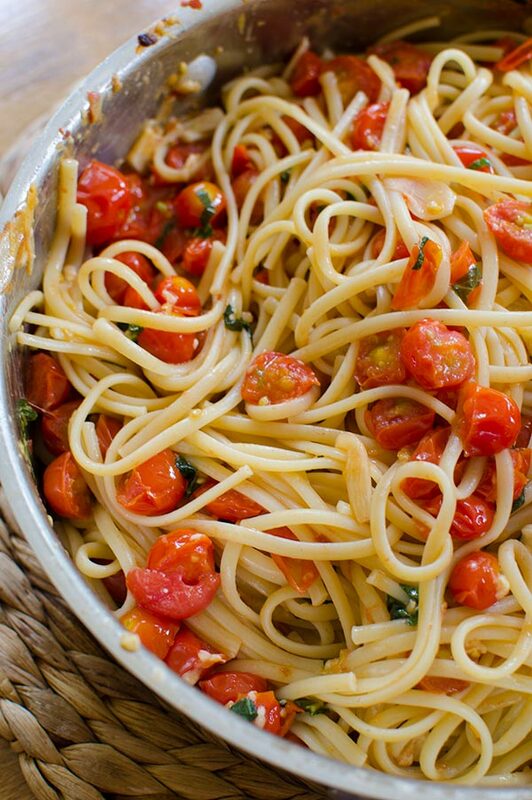 I make a similar pasta every summer when cherry tomatoes show up at my local farm store. I add sweet onion, red bell pepper, and a splash or two of balsamic vinegar. Depending on the acidity of the tomatoes, I might add a tsp of sugar. And I use some salt to taste as well. I love cooking it until the tomatoes pop, and squish them down to make them a little saucier. I always make more sauce than I can use on the pasta, because I love putting the leftovers on a piece of good whole grain sourdough toast for a quick snack! Hi Helen, that sounds delicious! I tend to add a touch of sugar to my tomato sauces as well depending on the acidity of the tomatoes. Love the idea of putting the leftovers on a piece of sourdough -- yum! And, I'm making it again! Thank you Mirella and Panos! I hope that you enjoy this dish, it's one of my favourites. Thanks Nancy, I'm so glad that you love this recipe! The cream, capers and Italian sausage would be delicious additions! This was amazing. So simple, but packed with flavour. Oops, just realized I forget the hot pepper flakes and I like some heat in my food,but didn't miss it. Will definitely make again. Thanks Antonia, I'm so glad you enjoyed this recipe! Thanks for letting me know. This recipe is truly my favourite pasta sauce! It’s light & soooo flavourful! Must make it soon again!